The Group Policy Search (GPS) is a browse and search tool for Microsoft Active Directory Group Policy Settings. This online tool from Microsoft allows you to easily find existing Group Policies and registry keys for different settings under Windows. You can either browse through the tree structure to find the settings you are looking for or use the search box to find them. If you are looking to change a particular setting on Windows but you are unsure whether a policy for your setting exists, the GPS will tell you. Or if you know that there is a policy, but you don't remember it's location, the GPS will find it for you. Or you may want to share this information with your team or another person, you can just share a link to the policy on the GPS and they will know what to do. 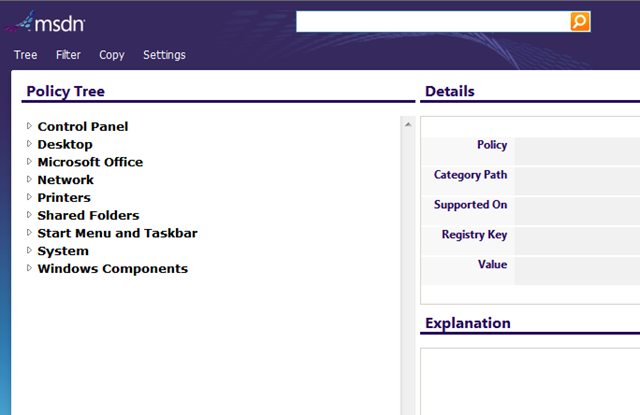 You can also switch from the Group Policy view to Registry view, where you can see the corresponding registry key/value. Once you have found the registry key or Policy name you were looking for, you can quickly copy the Policy name or registry values using the Copy menu. You can use the "filter" option to specify which products you want to search. For example, if you select IE7, it will find all policies which apply to IE7, or you can select only Windows 7 and hide all policies for Windows XP and Windows Vista. If you require a full list of Group Policy settings, you can download the Group Policy Settings Reference spreadsheets.